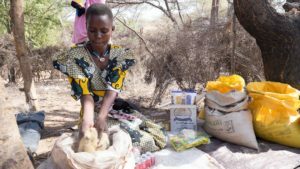 We are pleased to announce the finalization of a partnership agreement with Catholic Relief Services (CRS) to implement our Rural Entrepreneur Access Project (REAP) in Karamoja, Uganda. BOMA will be providing technical assistance to Caritas Moroto to implement REAP on the ground for 1,635 women to help them achieve food security, better nutrition and health, gender equity, and overall resilience, and working closely with CRS and Caritas Moroto on program design and measurement. As a gender-focused program that targets women living in extreme poverty and gives them the skills and resources they need to earn an income, establish savings and build resiliency, REAP has proven to be an effective, life-changing approach to achieving four of the United Nations’ most urgent Sustainable Development Goals: ending extreme poverty, ending hunger, combating climate change impacts and achieving gender equity by 2030. According to its rigorous impact evaluations, an average of 93% of participants have “graduated” from extreme poverty at the end of the two-year REAP program, based on BOMA’s strict criteria related to food security, sustainable livelihoods, shock preparedness and human capital investment.